Langtang is a region in the Himalayas of Nepal to the north of the Kathmandu Valley and bordering Tibet. 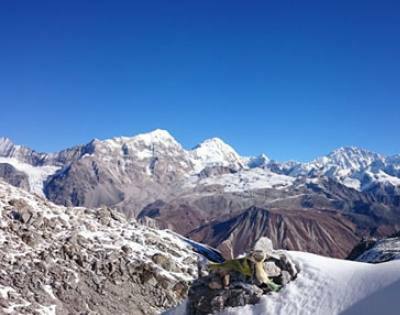 The Langtang National Park is located in the area. About 4,500 people live inside the park, and many more depend on it for timber and firewood. The majority of the residents are Tamang. The park contains a wide variety of climatic zones, from subtropical to alpine. Approximately 25% of the park is forested. Trees include the deciduous oak and maple, evergreens like pine, and various types of rhododendron. Animal life includes the Himalayan black bear, the goat-like Himalayan tahr, rhesus monkeys and red pandas. There are also stories of Yeti sightings. The village of Langtang was completely destroyed by a massive avalanche followed by the earthquake in April 2015. The village suffered an estimated 310 deaths, including 176 Langtang residents, 80 foreigners, and 10 army personnel. More than 100 bodies were never recovered.